Key Benefits of Drinking Water ! Water flushes down the by-products of fat breakdown and thus helps you lose weight. Drinking water also reduces hunger as it makes you feel fuller. It's thus an effective appetite suppressant. Plus, water has zero calories ! 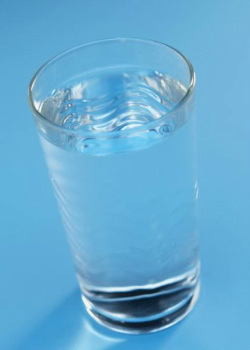 Water helps relieve headache and back pains caused by dehydration. Although many other factors may contribute to headache, dehydration is among the most common. Water replenishes skin tissues, moisturizes skin and increases skin elasticity. It hydrates the skin and makes you look younger ! Drinking water regulates your body temperature. You'll feel more energetic while exercising as water helps fuel and hydrate your muscles. Proper hydration helps keep your joints and muscles lubricated, and reduces the likelihood of cramps and sprains. Drinking water help you fight off the flu, and reduce your risk of other ailments ..... including kidney stones, strokes and heart attack. Water helps flushing out toxins and waste products from the body. Your brain is mostly made up of water, and drinking water can help you be more alert .... and to think and concentrate better ! Scientific studies have shown that water dilutes the concentration of cancer-causing agents in the urine and shortens the time in which they are in contact with bladder lining and thus reduces cancer risk. In Sacramento,California where I live, it gets extremely hot in summer - as high as 110 degrees F or more. A certain portion of our population walk around all summer long feeling tired and weak and headachy - never realizing a big factor in that is simply not drinking enough water. If people have existing health conditions they may feel even worse - and it could be dangerous. Give yourself every advantage - drink enough water and other appropriate, health supportive fluids - you'll just feel better !